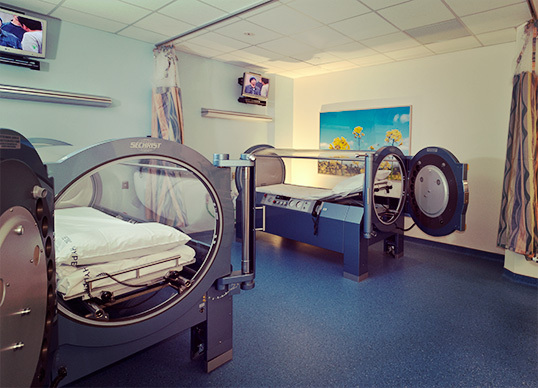 The Center for Wound Healing and Hyperbaric Medicine at SBH Health System is a leader in comprehensive wound care. Our Center is the only one of its kind in the Bronx that combines wound healing and hyperbaric medicine in a single location. It’s a collaborative effort between SBH Health System and Restorix Health. 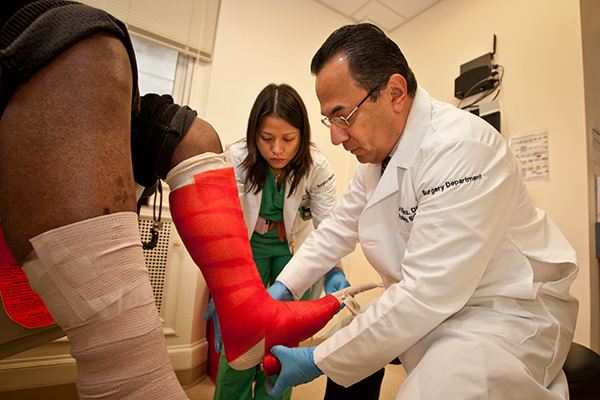 Under the direction of the hospital’s Chief of Podiatry Emilio Goez, DPM, the Center offers a comprehensive approach for patients with chronic wound issues including diabetic foot and leg ulcers, chronic bone infection, acute peripheral arterial insufficiency, necrotizing infections, crush injuries and other non-healing wounds. The Center’s multi-disciplinary team offers a comprehensive approach for patients with chronic wound issues. This includes physicians with advanced training in wound management and hyperbaric medicine and nurses skilled in chronic wound care treatment. Hyperbaric oxygen therapy uses 100 percent pressurized oxygen to promote healing. It’s safe and painless and involves spending 90 minutes inside a transparent tube while being treated and monitored by highly skilled technicians. Patients can watch television during treatment to help pass the time. Because diabetes is prevalent in our community, and many diabetics are susceptible to slow and non-healing wounds, the center is an important component in our patient care services.